I dedicate this Kamui to Yamibou-Eve! <3! I wanted to wall this ... for a long time, ok I just wanted to wall Kamui, and I picked this scan few months ago... It was my secret project, only one person knew what I was doing (love you <3) and I needed really lots of time to make it 0_0! but when it came to background, me and the other person had a serious discussion about it and we decided that he must be in water! 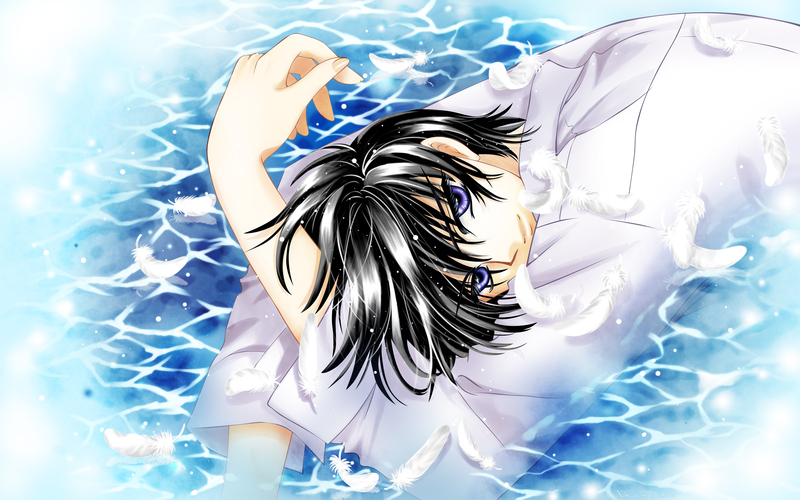 If CLAMP taught us anything, it would be this: Kamui looks good in water! I picked the white lines from some other watery scan, panted them and added some texture, and darker spots, and it looked like water XD brilliant isn't it? His mouth looks a little odd to me, I think its the lack of darker shade where the lips meet. kamui looks awesome in the water background. beautiful wall. well done! This wall look awesome >-<! The water, the hair and KAMUUUIII *O* are perfect! I really love the water, you did a nice job on it. You colored it so nicely, his face is really smooth. just looks off...but his eyes are great, nice detail. So pretty! Love how you did Kamui. The color's soft and... just nice! And the water look amazing too! I love this pic and the way you made the vector. This is so pretty. I love CLAMP, especially Kamui. And you've done very well on the vector, ur vector looks soft and smooth and awesome. Otherwise, you did a fabulous job on this one, is a fav. Nice wallpaper! You picked a very nice scan of Kamui and you vectored it nicely plus the water is amazing too. Water suites Kamui. The water is awesome, and uh... yeah. :D Not sure about the hair, but whatever, it's a good wallpaper. I think you just needed to add some more line work for the water and it wouldn't be a problem :). I always loved this pic and finally someone did a wall of it!